Caught in the new age of self-proclaimed “foodies,” I decided to take my fascination with food past the level of intricate and drool-prompting Instagram photos. I wanted to know about the part of food that you can’t stick a filter on. 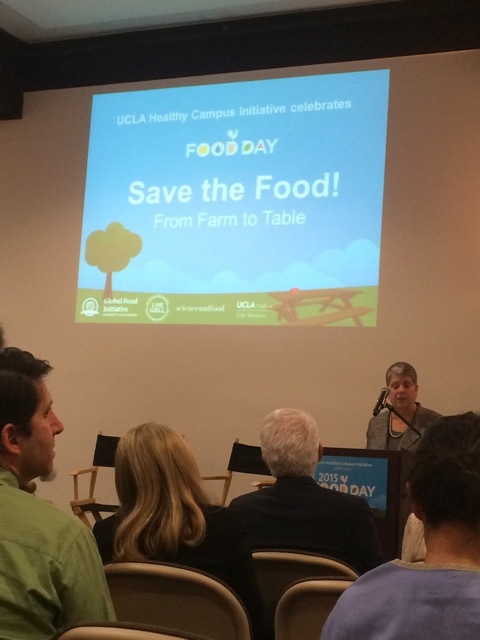 Organized by the UCLA Healthy Campus Initiative, “Food Day 2015: Save The Food From! Farm to Table” was a wonderful way for students and faculty interested in food, health, and campus affairs to get involved and informed. The event held last Wednesday, was a star-studded affair, with special presenters like Chancellor Gene Block, Ernest Miller and University of California President Janet Napolitano. President Napolitano spoke briefly about the University of California Global Food Initiative and fellowship offered to UC students. The program, called Food Fellows, was just extended an additional two years and has been extended to every UC campus, with $75,000 in funds going towards student food security and access, according to Napolitano. Through the Global Food Intiative, internships have been created for 20 students through a food studies course, working in conjunction with the Food Fellows program to address issues of food security and literacy. With the new humanities course, UCLA is on its way to the creation of a food studies minor. The Healthy Campus Initiative aims to make UCLA the healthiest campus in America. Who knew that level healthiness on campus would join the ranks of bragging rights for students like academics or sports long have? Universities have seen some big changes in the past couple of years, and health has been one of them. With a modern narrowed focus on campus health and student wellness, resources have become available about mental, sexual and nutritional wellness. As a part of this, recognized physicians, researchers and politicians have become involved in campus efforts towards student wellness. Good health has been recognized as a key component to keeping students informed about preventative measures, developing healthy habits on campus and also preparing them to maintain such habits in the real world. Schools are making health initiatives so accessible for students because they are aware that unhealthy habits stem from ease and accessibility, hence the rise of stereotypes like the “freshman 15″ or general perception that college students sweep matters of their wellness under the rug. There has been an increase in readily available resources like responsibly raised or grown organic foods at dining halls, classes capturing the educational side of health and nutrition and initiatives like free flu shots on campus. Healthy living is moving towards becoming a collegiate staple. According to the Save The Food Campaign, a third of produced food worldwide goes to waste, prompting the Global Food Initiative’s zero waste goal. Next to paper waste, food waste is the second largest source of waste by volume, according to the World Resources Institute. This issue is especially prominent on college campuses, especially with the resources needed to keep on-campus dining efficient and cost effective. Many campuses have turned to tray free dining and new recipes that can incorporate what society looks at as “ugly fruit” or atypical food parts, like broccoli stems or apple cores. This way, universities are able to encourage students, by example, to change their behavior and attitudes towards wasting food. Proper preservation of food is an art in itself, with many culinary institutes offering classes on how to utilize such techniques. A few include dehydration, canning, fermenting, and pickling among others. Though these methods are difficult to carry out if eating at a dining hall, it is easy to become informed and start practicing such habits when possible in order to move towards effective preservation. Miller, the co-founder of Slow Food LA, gave a presentation on such techniques, showing some examples and posing food as the foundation for civilization and culture, serving as part of the basis for which family, society and economy is built upon. For me, the event was an effective and informative way to put the issue of food waste on the forefront of a campus wide revolution, raising awareness about the issue and showing students how they can integrate the issue into their collegiate careers.